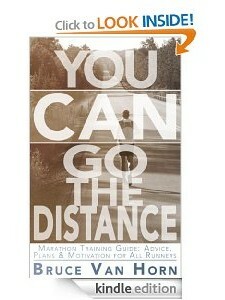 Yasso 800s: Speed + Endurance - You CAN Go the Distance! I believe God made me for a purpose, but He also made me fast, and when I run I feel His pleasure. There is really only one way to learn how to run fast and that is: Run fast! When I first started running marathons, I dreaded the speed workouts that were part of the various training programs I tried. Not only did I not enjoy the workouts themselves, they were also just too complicated—too many combinations of distances, intervals, speeds, target heart rates, VO2Max calculations, etc. Those are all great if you are really into the science of running. Me? I am just an ordinary guy who loves to run and wants to run faster, but who also wants to keep it simple! So guess what? I usually skipped the speed workouts and just focused on the mid-distance and long runs. Because I skipped the speed workouts, however, I never could run as fast as I wanted to run. I do not remember if it was from a friend or from an article I read about running, but somehow, several years ago, I discovered the “Yasso 800,” a speed workout invented by well-known runner, coach, and Runner’s World author, Bart Yasso. As soon as I heard about Yasso 800s, I knew I had to try them. As soon as I tried them, I was hooked! Let me explain Yasso 800s to you so you can try them and see if they work for you. First, let’s break down the name: “Yasso” is from the inventor’s last name, Bart Yasso. “800” is for 800 meters. Hence the name, “Yasso 800s.” With me so far? Good! What Bart discovered for himself and then started teaching to other marathon runners is that, if you can build up to doing 10 repetitions of 800 meters (.5 mi, or 2 laps around a track) at a target pace, you should be able to run your marathon at your target time. The formula could not be easier! 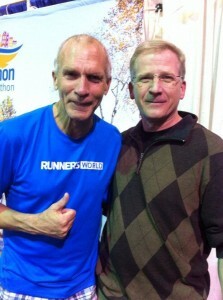 You simply take your Marathon Goal time in hours/minutes and convert that time to minutes/seconds. You use that as the time for running your 800 meter repetitions. Here is how it actually breaks down during the workout: I do a 1 mile warm-up jog to the track near my house. Because my marathon goal is 3 hours and 30 minutes, my target 800 meter target time is 3 minutes and 30 seconds, which equates to a 7 minute per mile pace. I start running my 800, looking at my GPS watch occasionally to check my pace and adjust accordingly. After completing the 800, I do a very easy—walking/jogging—recovery lap. Then I repeat this process for however many reps I need to do for that workout. When I am done, I do an easy 1 mile recovery jog back home. So here is another example at a different pace. Let us suppose you want to run your first marathon in 5 hours. That means you would do your Yasso 800s in 5 minutes (which just happens to be a 10 minute per mile pace). For beginners, I recommend starting with 2 Yasso 800s for your first workout. If you are able to do both 800s at the target pace, then try to add 1 more every other week throughout your training schedule. You will discover later in the schedule that it is hard to add those extra reps! When the rep count gets higher, in Bart’s own words, this is a “brutal workout”! Do not get frustrated; just keep trying to add reps until you get to the magic number 10! Here is an important tip that I constantly have to remind myself. I always like to do better than my goals, so I have a tendency to run the 800s faster than I should. When the rep count gets high, it is extremely hard to get in those last reps at the target pace and I usually feel frustrated because the last few come in slower than target. Do not run faster than you need to, especially at the beginning! This is crucial for your mental conditioning, too, because it is so tempting to go out faster than you should during your marathon. You will regret it if you do. Save your energy for the last few reps. Teach your brain to trust the training plan and training paces. Getting ahead of the plan usually causes more harm than it does good. When looking at your training schedule, you will want to try to get to 10 Yasso 800s around 3 to 4 weeks before your marathon. Do not try to do 10 of these with only 1 to 2 weeks before your race because you will need those two weeks to taper (recover)—which I talk about in a later chapter. No access to a track? You can do this just as easily on the road if you are able to measure out a 1/2 mile stretch. Run out and back, nice and easy, as a warm-up. Then run out at your Yasso 800s pace and simply jog back to the starting point. I sometimes do this just to break up the monotony of doing the same workout week after week on the track. The reason Yasso 800s is such a great workout is twofold: First, because you are running much faster than your target marathon pace, you are teaching your body how to run fast. Second, 800 meters is a long enough distance that your body is learning how to hold a faster pace over a longer distance, thus building endurance! You will need both speed and endurance to reach your marathon goal on race day! Yasso 800s have definitely helped me become a faster, stronger marathon runner. I believe they will help you too! Give them a try and let me know how it goes.